← What a kisser on this one …. 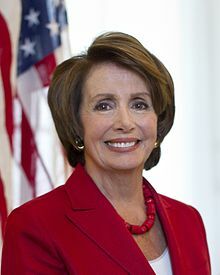 HAMPTON, N.H. – Anyone looking for signs that Nancy Pelosi has lost clout within the Democratic ranks this cycle need only catch a glimpse of last week’s candidate forum in New Hampshire’s 1st Congressional District. When 10 Democratic candidates were asked if they’d support the House minority leader for speaker if elected and the Democrats regain the chamber’s majority, only one raised his hand. Their hesitation speaks to a growing uneasiness among this year’s midterm candidates – especially in swing districts – with the veteran California Democrat’s grip on power. Many time it may take weeks, months, years or even decades before some powerful idiot losses their backing and support. That just may be the case with Nan the Nuisance. She has run her mouth so many time without substance and flapped her lips making herself look ridiculous, it seems to have caught up to the Old Beat up Broad. These documented blunders of Pelosi are just a few of her outstanding faux paws. We all know just how fickle and back stabbing politicians can be. Sooner or later, if they feel they are supporting a loser, no matter how powerful they think they may be, they will throw their use-to-be ally under the bus. I can’t say I have any sympathy for the Old Hag. It is about time she gathers up all of her bonnets and makes her exit. It is long-over-do that she becomes just a plain ordinary citizen of the USA where she can’t get stir up the pot, instead of a pain in the posterior politician. She probably doesn’t like being up-staged by her cousin from southern Italy that has been on a rampage lately. That is why Nan is making so much noise lately. Gotta be noticed and try to stay up with the competition.